The experience economy is dubbed to be the economy that follows the diminishing service economy. Experience economy is simply where goods and services are sold by emphasising the effect they have or experience they bring to people’s lives. With service features like great customer service and free delivery fast becoming outdated competitive advantages and now seen as standard expectations when purchasing products, the experience economy is taking over as the new economy and competitive advantage for businesses. Where did the Experience Economy come from? Its common knowledge that pre-World War 2, people were accustomed to purchasing products from a very limited range of products. Post World War 2, when people got wealthier, the western, now industrialised world began to offer a much wider range of products and suddenly consumers were faced with an increase in choice. With an increase in variety and supply of products came an increase in competition. Companies in all industries quickly found themselves struggling to find ways in which they could differentiate their products from one another. This was the grounds that resulted in a shift from a product-based economy to a service led one. The creative masterminds that latched onto this concept began to offer services, around products that they could not differentiate from competitors’, in order to give them a competitive edge. Service led additions to a product – customer service, free delivery, price matching and extended warranties, all quickly became ways of attracting customers to buy their products and seal the deal. The development of the internet and digital technology has meant that consumers now expect these services as standard rather than them being a competitive advantage for companies to differentiate their products from one another. What does this mean for businesses that exhibit? With so many variations of products, they have all become ‘vanilla’ with very little properties differentiating them. Consumers are able to source a variation of almost any product to suit their income level and as a result, consumers feel there is more value in doing things than owning things. This is a great opportunity for companies to differentiate and gain a competitive advantage by ‘how’ they do things and ‘who’ they do things for rather than trying to differentiate their products from the competition. For example, in terms of technology, there is very little difference between products produced by a company like Apple than other tablets, laptop and mobile phone manufacturers, but still, consumers feel Apple is far superior. This is because of the experience that Apple provides for their customers when consumers visit an Apple store they receive an experience and not just another phone shop. This concept goes hand in hand with exhibitions and events. When exhibiting at an event, it is vital you create an experience for your visitors so they remember your stand. When visitors are presented with hundreds of stands at an exhibition, although product is important, without giving visitors a memorable experience your stand is likely to be forgotten. Here at XL Displays, we understand the immense power an experience can have on visitors when visiting a stand and that is why we have an extensive range of products to maximise user experience at events. Our Inflatable Furniture has been designed to create a modern and contemporary aesthetic, perfect for marketing and hospitality events and exhibitions. This range of Inflatable furniture can be illuminated in a range of colours to provide a unique experience for visitors. The optional LED lights create an ambience for visitors at any event as well as maximising your brand exposure, even long into the night. The unique design of this range of Inflatable furniture is sure to be a show stopper and have visitors leaving your event or exhibition stand remembering your brand and products. The Signus ONE is a fully customisable inflatable brand pavilion which guarantees maximum brand visibility and marketing potential. The remarkable and organic design is what makes the Signus a true eye-catcher at exhibitions and experiential marketing events. The three-layer construction is made up of a hardwearing one-piece inflatable frame, waterproof white cloths which are covered by the custom printed cloths for marketing your brand. The fire retardant customised cloths are printed using a dye-sublimation printing process which produces outstanding detail with a high-quality finish. The impressive size and innovative design of Signus Inflatables UK offers your brand unlimited exposure with huge marketing potential. The unique shape and high-quality print is enough to be at the forefront of visitors’ mind once they leave your event or exhibition stand. The X-GLOO events tent creates the perfect environment in which to create an experience to remember for your visitors. With trusted German engineering and it's unique design, the X-GLOO is a popular choice amongst brands who want to enhance the experience they provide for events visitors. The X-GLOO is a striking inflatable event tent designed with the iconic shape of the igloo in mind. 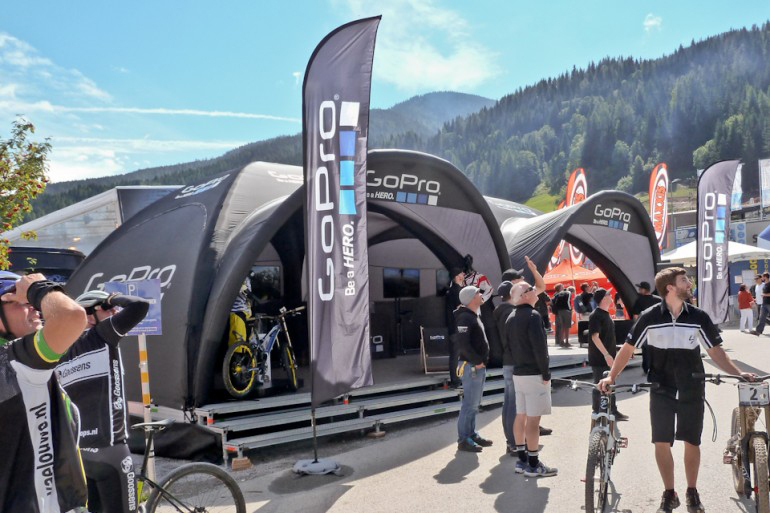 Offering limitless customisation and brand potential, the X-GLOO is an ideal solution for any company looking for a striking and eye-catching presence at events. Sturdy and resilient, the events tent is more than suitable for both indoor and outdoor occasions. Set your brand apart from the rest and create a truly memorable experience for your visitors and don’t be left behind in the experience economy. For more information about the X-GLOO, Signus or our range of Inflatable Furniture, please contact us or call us on 01733 511030.